The MS Botticelli sails on the Seine River (France). From Paris to Honfleur, navigate along one of the most typical rivers of France and explore Normandy, the region we commonly call the “Gardens of Paris” on your way to the Côte Fleurie. Facilities include a lounge-bar with a dance floor - bar - dining room - large sundeck with deckchairs - French balconies - gift shop. Central heating, 220V electricity, air-conditioning, radar, radiophone, Wi-Fi on board. 4 night cruise sailing from Honfleur aboard the MS Botticelli. 4 night cruise sailing from Paris aboard the MS Botticelli. 5 night cruise sailing from Paris aboard the MS Botticelli. 6 night cruise sailing from Paris aboard the MS Botticelli. 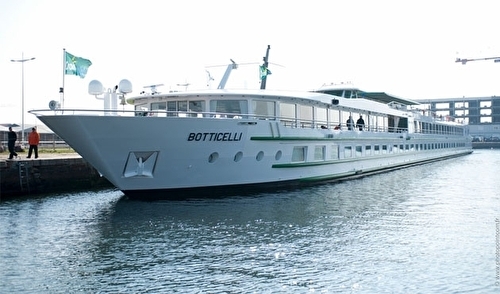 3 night cruise sailing from Paris aboard the MS Botticelli. 7 night cruise sailing from Paris aboard the MS Botticelli. Spacious and comfortable cabin converted for passengers with reduced mobility, equipped with one double bed, private bathroom with shower and bath products, telephone, satellite TV, safe, hairdryer, air-conditioning, radio and wardrobe with hangers. Located at the middle deck it offers a panoramic view.